King Street Station at O'Dark Thirty. Where the journey began! When I was 15 I took a little trip by myself. I took the train from Seattle, Washington to Albany, Oregon. I had purple and green streaks in my hair. My Dad got me a backpack. I thought I was so cool. I didn't just think l was cool, I felt cool. Since that trip I've never taken the train around the West Coast again. 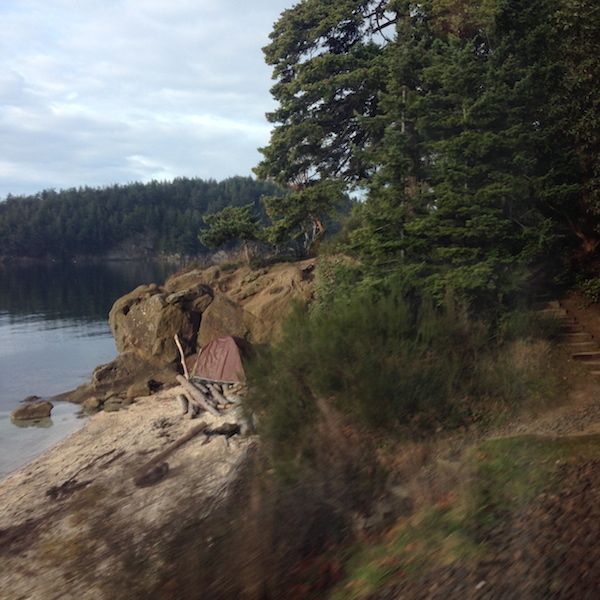 I decided to ditch the driving this holiday season and took the train to visit my scattered West Coast family. Not gonna lie, I feel pretty cool. Driving is for the birds - seriously....for the birds! I could really stretch out. Plenty of leg room! The Bistro Car. Hello cinnamon bun and coffee or Hello bloody mary? You decide! Wifi! Get some work done! Catch up on blogs! For Free! Yippee! The stations were all really convenient. Isn't it nice to be able to just meet your family? They can walk you right to the door when you leave too. Plus, they're all right around other modes of transportation. Easy Peasy! The border crossing was painless. I've had some slightly negative experiences when driving through the border. Plus, this time of year the wait could have been hours. Amtrak was right on top of The Social Media. I got messages back on Instagram and Twitter! ....and the gold star goes to....Amtrak! THE VIEWS. Hands down my favorite thing. I kicked, kicked, kicked myself for not having my 'big camera'. Phenomenal. When considering energy consumption per passenger mile Amtrak is the clear winner of air, auto and bus. I realize this reads like a very bulletized Amtrak Public Service Announcement - and it is! I want more people to take the train! Why? Because maybe then there will be more routes available! America is so far behind in the public transportation department but, part of the problem is that Americans aren't taking the public transportation that is available. Honestly, when I booked my travel my number one reason was to build in 'alone time'. I was hoping from place to place and person to person - I knew that as a quasi-introvert (okay fine, bonafide introvert) I was really gonna need some downtime. Sure you can say a solo drive is alone time but, unless you're really rocking the podcast it's not very productive or relaxing. I can say with no qualms that my train rides were both. There are trains in my future. I see it. I can't wait for my next train trip. I'm especially excited to try out a sleeper car! Take the train! I'm fairly certain you won't regret it!